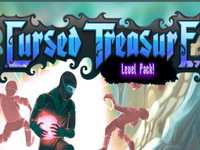 Description: Level pack for the popular tower defense game Cursed Treasure.Take on the role as the evil overlord of the orcs, demons and the undead and protect you gems from being stolen by the righteous heroes. Instructions: Try to annihilate the enemies before they grab a gem, but even if they do, you’ll have a chance to stop them on their way back and save your gem. Use your mouse. Hold SHIFT to build multiple towers or cast multiple spells. You can also use hotkeys. See in-game hints and tutorial for more info!